Growthpoint Properties has launched its G-Eco initiative with the installation of a food waste composting machine at Growthpoint Business Park in Midrand. This machine, the Heron IVC, is locally manufactured in South Africa by Earth Probiotic Industrial (Pty) Ltd. 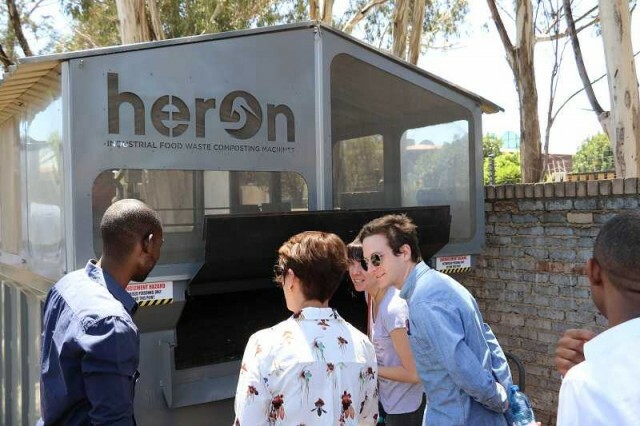 The Heron IVC turns food waste into compost and can process up to 1,000kg of food waste per day. The Heron IVC was installed at Growthpoint Business Park in July 2017 on a trial basis by Life & Earth, the "waste to soil" division of Life Green Group. Food waste is collected from a number of Growthpoint buildings and clients including Growthpoint Business Park, Woodlands Office Park, Woodmead Retail Park and Central Park. Through this green initiative GrowthPoint properties address a number of issues which can impact on their and their client's business. Eliminating food waste as risk. As food waste rots, there is a risk if it would not be removed by the contracted waste company (this could include labour action such as what occurred during the Pikitup strike). Legislative risk is also a factor where there is a real probability of food waste (and other organic waste) being banned from landfill after 2020. Composting food waste – a long-term cost saving exercise. Of course, financial risk is a major factor. This relates to two issues: minimum wage legislation will increase waste management costs. Secondly, with landfills nearing end of life waste will have to be transferred over larger distances. With food waste representing between 40% and 60% of general waste volumes, removing this from the waste stream through composting addresses these business risks. Environmental responsibility is key to Growthpoint. Through the G-Eco initiative, Growthpoint will address the large volumes of food waste generated by their clients across their properties. Clients are encouraged to separate food waste (which is a legal requirement) which is then removed and composted by the Heron IVC in Midrand. The composting of food waste will reduce CO2e emissions by 235kg per tonne vs. landfill: a significant number when one considers the Growthpoint property portfolio. At Growthpoint Business Park the composted food waste is added into Life Landscapes' on-site garden waste composting windrows. The food waste adds valuable nutrients to the mix which enables Life Landscapes to produce a nutrient rich compost for reapplication onto the property. On-site composting has a significant positive impact on the environment. This strategy removes the carbon footprint associated with the removal of garden waste and then the delivery of that waste back to the site in the form of compost (a double whammy). The G-Eco food waste composting initiative will help Growthpoint reduce waste risks while building a better environment on its properties. Whilst demonstrating sustainability and environmental responsibility leadership.